In 1685, Dutch merchants Francis Rombout and Guilian Verplanck received their Crown patent for the purchase of what is known as the Rombout Patent, the first and largest portion of Dutchess County to be licensed for purchase from the Wappenger Indians. The town of Fishkill covers only a small portion of this 85,000-acre parcel of land, but it played an important role for years to come in the shaping of the region and the nation. In this vibrant new pictorial history, over 200 vintage images bring to life the changes that have occurred over the past century in this Hudson Valley community, from Dutchess Junction, Timoneyville, Glenham, and Brockway, to Baxtertown, Osborn Hill, and Brinkerhoffville. Readers learn more about the key role that Fishkill played during Revolutionary times, and view area homes where notables like Lafayette, George Washington, and Generals von Steuben, McDougal, and Putnam headquartered. 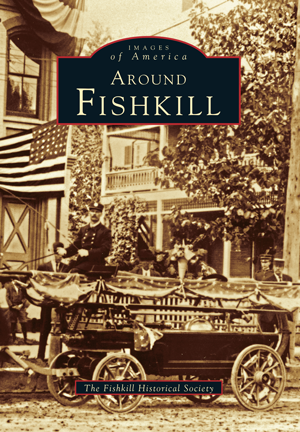 Gathered from the cherished collections of the Fishkill Historical Society and countless residents of the area, this pictorial history is truly a community effort, demonstrating the closeness that is still woven into the fabric of the town's businesses and homes. Residents and historians alike will surely delight in the group's thoughtful and enduring compilation, produced under the guidance of Roy Jorgensen and Patricia McGurk.